Pide at Pide ve Lahmacun. Other than shooting a Key Ingredient there, I hadn’t been back to Fat Rice since opening night, but there we were at home on Friday night, all in one place and hungry at 5:40, so I knew what we had to do was jump in the car and be there when the restaurant opened at 6— before the lines, which are supposed to run up to two hours these days, became hopeless for a family with impatient kids. A few months ago I found Fat Rice promising but not yet something that could change my ideas of Asian food— not the Chicago answer to Momofuku or Pok Pok or other hot Asian places around the country. It shouldn’t be something one worries about to wish we had a place that scored on the food-hipster scale like those do, but hey, we have civic pride, just ask Rachel Shteir. Or take her to dinner at Fat Rice, which is fantastic and might just change her whole outlook. Asian fusion is often just Asian food minus the funkiness and with the sweetness dialed up. It’s a form of upscaling ethnic food that basically trashes it. Not at Fat Rice, which reaches into one of the original Asian fusion cuisines— Portuguese-influenced Macanese (Macau) food and finds a cuisine that has the brightness and funkiness of Asian mixed with the deep earthy slow-cooking virtues of European peasant food from Spain or southwest France. The best dishes, like the eponymous Fat Rice, are deep and dark, dotted with funky sausage, dishes you could burrow into for the whole winter. Others, like the chili clam with fried and sashimi clam on chilis and glass noodles, are nimble, as light-fingered and fresh-tasting as anything at Arami or, for that matter, L2O. Even fairly conventional dishes, like the pot stickers (which come as a single piece attached by a crepe-like skin) or the pepper steak with coconut rice, light up your mouth like a Christmas tree with bright flavors of fresh vegetables and meats that instantly set them apart from the muddle of the conventional Chinese-American food they might resemble at first glance. Not to be confused with the farm to table restaurant of the same name on the roof of Roots Handmade Pizza, the Homestead at 6144 N. Lincoln is a cute little breakfast and early-bird dinner comfort food place whose country decorations and welcoming air seem to have come straight out of a small town cafe in downstate farm country. The staff is sweet as can be, the restaurant is squeaky clean, and the food is maybe a little too squeaky clean if, like me, you like a little funk and soul in your diner food. But they bring you homemade chicken soup before Sunday breakfast (and it’s probably the best thing here)— c’mon, the whole place is adorable. Laschett’s Inn is walking distance from my house, yet I hadn’t been there since a meal commemorated on LTHForum in its early days. That is, I’ve tried 3 or 4 times and had an endless run of bad luck— they were open but not serving food, they were closed for a private party… whatever. Finally went with my sons and found, from the menu, that they had an expanded back area and another set of new owners (at least the second set if not more since Karl Laschett took over an even older business, apparently). Still, it remains one of the best examples of an authentic ethnic restaurant in town; it totally captures eating German food in… Milwaukee, with a supper clubby feel and waitresses who not only call you “hon” but are downright overflowing with gemütlichkeit. 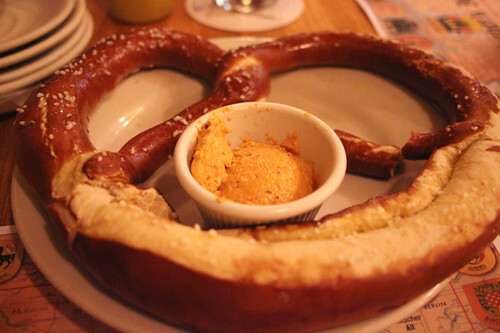 Starters were great— the giant freshly-baked pretzel with a tart cheese spread made of camembert and brie (and cheddar, surely, to judge by the color), and the hearty, satisfying goulash soup (a dollar upgrade when they ask you “soup or salad,” and well worth it). So it was a bit of a bummer that main courses took German heaviness a little too far— Wienerschnitzel was coated much more thickly than at Resi’s across the street, the frikadellen beef-pork burger seemed a bit dried out, while the potato pancakes ought to have been crispier. It’s still a charming slice of a Chicago that existed into the 80s and early 90s, but set your expectations more for hearty good time than culinary distinction. A more exotic act of ethnic recreation takes place at Pide ve Lahmacun, a new Turkish restaurant at Irving and Ravenswood. Actually two new Turkish restaurants, there’s another storefront called I-Cafe but you can have the food from either one at the other. I don’t usually play the “This is just like the feng shui we ate in Yokohama” game, not being the world traveler some are, but having been to Cappadocia, I can say that this is just like the food in Cappadocia, because there are only two things to eat in Cappadocia and pide was one of them so I had it several times. What is pide? 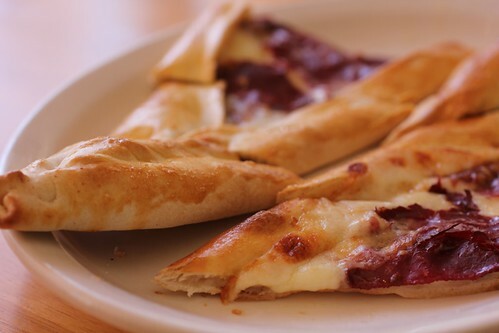 Basically it’s Turkish pizza, football shaped and topped with cheese but not tomato sauce, and often eaten with very salty air-dried basturma (pastrami) on top. Is it better than the pizza you normally get delivered? No, but it’s pretty good, and so are the other things they have— their version of Iskender Kabob (doner meat, tomato sauce and tangy yogurt) was bright and flavorful too. But my son and I went there to eat pide, and for a moment, we were members of a secret society remembering the strange thing we had eaten in our travels in the east. Remembering it exactly, in fact.